Screenshot from NatGeo’s video (below). “Out of the blue, it almost looks like a bright green and red space ship came underneath my camera,” recalled Gruber of the “glowing” hawksbill turtle–an endangered species–that appeared in front of his lens during a recent night dive off the Solomon Islands. Scalloped hammerheads and silky sharks were swimming inside the Kavachi Volcano’s caldera off the Solomon Islands. 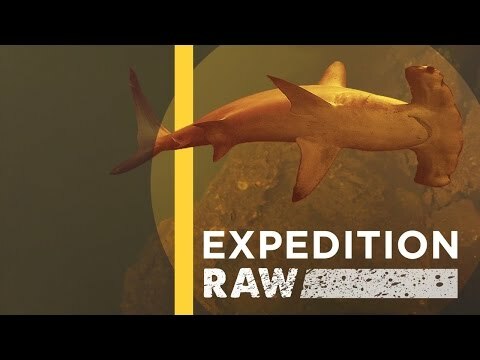 Screenshot from NatGeo’s video, “Sharks Discovered Inside Underwater Volcano”. The last few years it has been hard to miss the ‘so bad it’s good’ trilogy ‘Sharknado’; a waterspout that lifts sharks out the ocean, dumps them ashore in Los Angeles, and apocalyptic chaos ensues. What you may not have heard of is the recent discovery of a real ‘SharkCano’, 147 feet deep in an undersea volcano in the Solomon Islands. The volcano, known as Kavachi, is highly volatile (acidic) and extremely active, thus very hard to study. At an opportune time to collect data between explosions, Brennan Phillips and his National Geographic crew sent a camera into the sunken caldera. What they found there was a complete surprise; two sharks–and a sixgill stingray–seemingly thriving in the plume and a hot acidic environment with carbon dioxide and methane bubbles rising from the seafloor vents. Not exactly hospitable elements for biology, as we know it. Video shows the team watching the footage live with excitement seeing the sharks and stingray in their “cave-homey-thingy”. Above: The NatGeo team marvels at the discovery. Screenshot from NatGeo’s video, “Sharks Discovered Inside Underwater Volcano”. Photo: Paul Nicklen/National Geographic. Video below. National Geographic Fellow and photographer Paul Nicklen captured this shot while on assignment in Antarctica to film emperor penguins, champion freedivers that can reach depths of nearly 2,000 feet, and stay there for over twenty minutes hunting fish, squid and krill. When it does come time to rocket to the surface, the deepest diving bird known to science and rattles its feathers to expel trapped oxygen, or “micro-bubbles”. This not only looks cool; it functions like a turbo charge and allows the 70-pound penguin to swim two to three times faster. Whale shark by Adriana Basques. Check out award-winning photographer Adriana Basques’ gallery of the giants that rule the sea. This series of ‘big animals’ photographs contrasts against her ‘miniature life’ underwater gallery. Three Sperm Whales by Adriana Basques. The waters surrounding the most beautiful island no one will move to have just become the newest and single largest marine reserve in the world. The British government announced on Wednesday the special protection of a 322,000-square-mile (830,000-square-kilometer) contiguous body of water surrounding the islands in an attempt to curb illegal fishing activity. Furthermore, there will be no seismic testing permitted, and the only people allowed to fish the area will be the local population — and only in their traditional way — reports National Geographic Explorer-in-Residence Enric Sala (who led a 2012 expedition which first established the case to protect the waters). For the first time in 100 years, the National Geographic Society has constructed and released a comprehensive map of Cuba, which includes two new provinces since National Geographic completed their last survey, in 1906. What does Bangladesh do when floodwaters rise? Put the schools on boats and convert the rice patties of the Ganges Delta to salt-tolerant shrimp and crab farms, of course.